My clickin’ moment with OH! HOME Synopsis; After a hive-minded alien race called the Boov conquer the Earth, they relocate the planet’s human population — all except for a little girl named Tip (Rihanna), who’s managed to hide from the aliens. When Tip meets a fugitive Boov called Oh (Jim Parsons), there’s mutual distrust. However, Oh is not like his comrades; he craves friendship and fun. As their distrust fades, the pair set out together to find Tip’s mother, but, unbeknown to them, the Gorg — enemies of the Boov — are en route. The Kid in Me: Of Cosplays, Costumes, Events, Collections , Fairytales, Comic Cons, Sanrio, Barbie, Lego, etc. With Alodia Gosengfiao, ‘Sarap Diva’ (2015) TV show Cosplay & Toy collections episode! With Alodia Gosengfiao’s staff, ‘Sarap Diva’ (2015) TV show Cosplay & Toy collections episode! With ‘Skipper’ of ‘Penguins of Madagascar’ (2015) movie, ‘Basta Every Day Happy’ TV show promo! Chinese New Year (2015), mall interior design display! Chinese New Year (2015) Year of the Goat, mall interior design display! Valentine’s Day (2015) huge bouquet, mall interior design display! Family ‘Valentine’s Day Heart’ (2015) celebration! Christmas (2014) ‘Snow White and the Seven Dwarfs’, mall interior design display! Halloween (2014) ‘Ghosts and Zombies’, mall interior design display! Family ‘Pirates of the Caribbean’ New Year (2014) costume party! 75 Years of Batman celebration (2014)! Halloween (2014) ‘Skulls and Bones’ party, mall interior design display! Barbie LIVE at SM MOA Arena, with the cast! Sanrio Little Twin Stars (2013) exhibit! Family ‘Medieval’ / ‘Game of Thrones’ costume party, went as a Queen of course! Family ‘Go as your icon’ costume party, went as gay icon Manila Luzon! Family ’60s costume party, went as Jacqueline Kennedy! Coca Cola event (2010) Wanted to bring this huge bottle home for our Coca Cola collection! SUGAR CRAVINGS: Satisfy your sugar cravings! SUGAR CRAVINGS interiors is so dainty! I received an open invite from the owner of SUGAR CRAVINGS in February but had the time to visit with my cousin after almost a month because of the daily show. The location is not ‘commuter-friendly’ unless you are familiar with DAMAR Village along araneta Avenue, SUGAR CRAVINGS is right beside its main entrance. Or if familiar with commuting along Araneta Avenue, you can take the Jeepney which goes from Araneta VAnue to La Loma. We stayed at their VIP area wherein you may hold your special occasions, a private tea party or just want a bit of peace and quiet while dining. Upon entering you’ll be greeted by a huge ‘Ferris Wheel’ cupcake vessel, which I would definitely like to have for family gatherings. 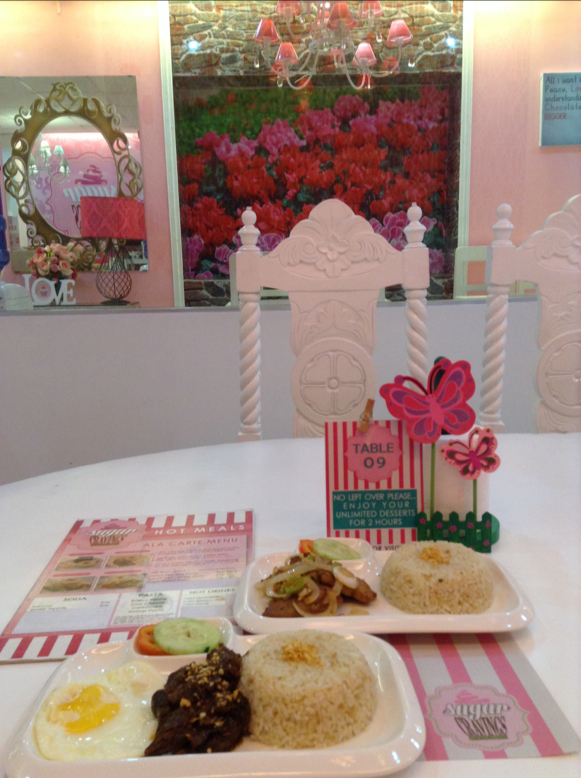 At the main cafe, the dainty interiors, pink & white with floral walls and pink mini-chandeliers transports you to a tea party mood. A selfie at SUGAR CRAVINGS’ huge ‘Ferris Wheel’ cupcake vessel which I’d like to take home! If you want a meal before going on a sugar rush like me, they have an ala carte menu and coffee to boot. I Super liked this personalized Mango Crepe at SUGAR CRAVINGS! 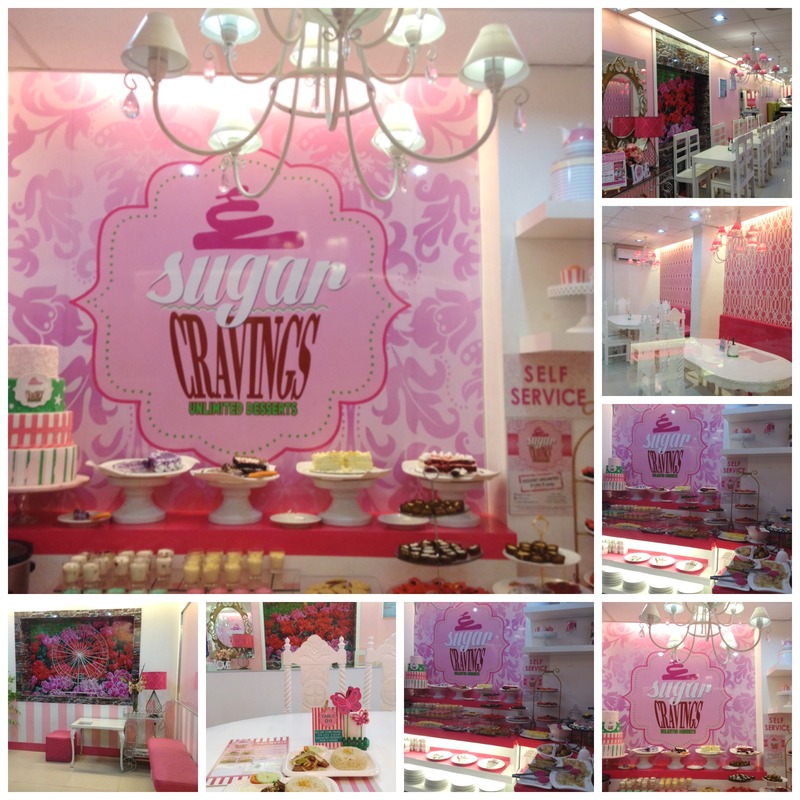 SUGAR CRAVINGS is a kikay selfie-addict’s wonderland! Their dessert buffet fare consists of cookies, cakes, mini creme puffs, ice cream with cereal or sprinkles, shot-glass creamy desserts, chocolate crinkles, different brownies, yema balls, etc. I also liked that they have ‘dynamite’, green mango and ‘singkamas’ (turnip) slices with ‘bagoong’ (shrimp paste) to sort of break the sugar taste if need be. The place is perfect for private functions and celebrations (Glaiza De Castro and her fans had a mini-gathering here a few weeks ago) or for a quiet date with loved ones. 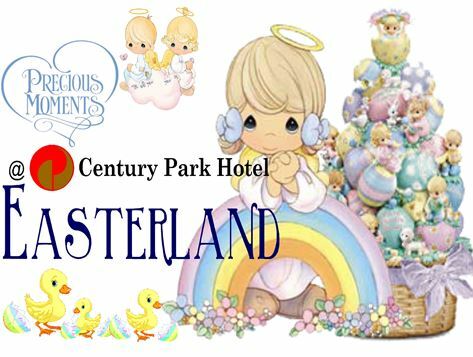 Rejoice in a fun-filled day with your family and friends on April 5, 2015 from 9 am to 1 pm at the Grand Ballroom as Century Park Hotel turns your Easter moments into a precious celebration. Wander in a land full of exciting activities like interactive games, coloring contest, face painting, mascot dance, enchanting magic show and the traditional egg hunting. Enter Easterland and get a chance to win raffle prizes and bring home bag of give-aways from our participating sponsors – Trolli, Asia Brewery, Chips Delight, Happee Toothpaste, HBW, Lemon Square, Leslie’s, Lotte, Manila Bulletin, Miramar Confectionary Corp., Oishi, Toy Kingdom, Yakult, Mentos, Fun Ranch, Jack ‘n Jill, Farm House, Pizza Pedrico’s, Aficionado, J.Co Donuts and Coffee, Enchanted Kingdom and Star City. CINDERELLA 2015 Synopsis: After her father unexpectedly dies, young Ella (Lily James) finds herself at the mercy of her cruel stepmother (Cate Blanchett) and stepsisters, who reduce her to scullery maid. Despite her circumstances, she refuses to despair. An invitation to a palace ball gives Ella hope that she might reunite with the dashing stranger (Richard Madden) she met in the woods, but her stepmother prevents her from going. Help arrives in the form of a kindly beggar woman who has a magic touch for ordinary things. A clickin’ moment with CINDERELLA’s life-size golden carriage! Ate Fely and her selfie with CINDERELLA’s life-size golden carriage! CINDERELLA’s larger-than-life blue ball gown!